One of the many crests that represent the GOSSELIN name. 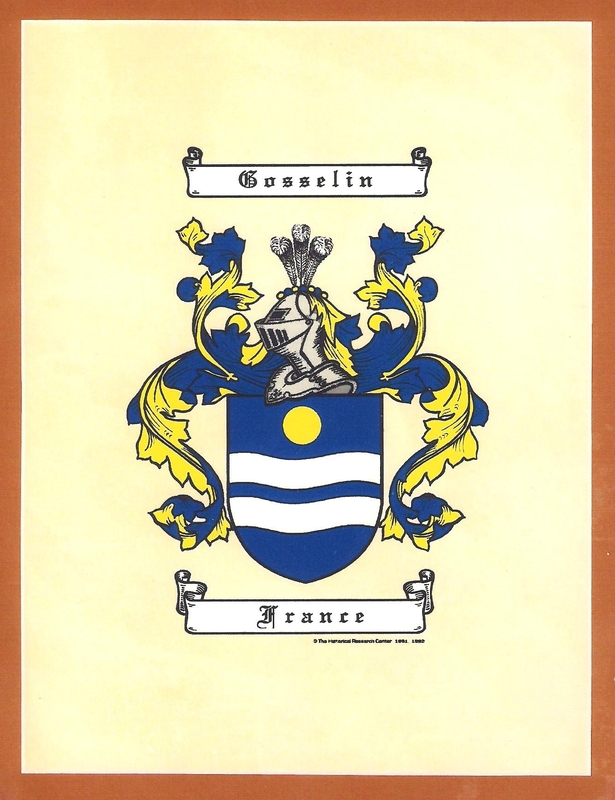 but in the records so far for my family I have only ever seen it spelt as ‘Gosselin’. 1914 – born in Jersey on the 25 April. 1940 – Rene marries Edith May Bouchere. 1941 – Rene is living with his family at Elim, La Mare, Samares, whilst Jersey is under German Occupation during World War 2. He is working as a ‘grower’. 1977 – Rene dies on the 10 May. 1885 – born in Plaine Haute, Cotes-du-Nord, France on 26 June. 1900 – Pierre arrived in Jersey around the turn of the century when many French farmers came over to the island for work. 1911 – On the 2nd of April 1911 Pierre was living at Hope Cottage, Samares, St. Clements in Jersey when the 1911 census was taken. He was head of the household – married for one year – aged 26 – working as a ‘pay labourer on farm’. He was living with his wife Blanche Jehan – age 20 – work was ‘charing’ (char lady?)’. 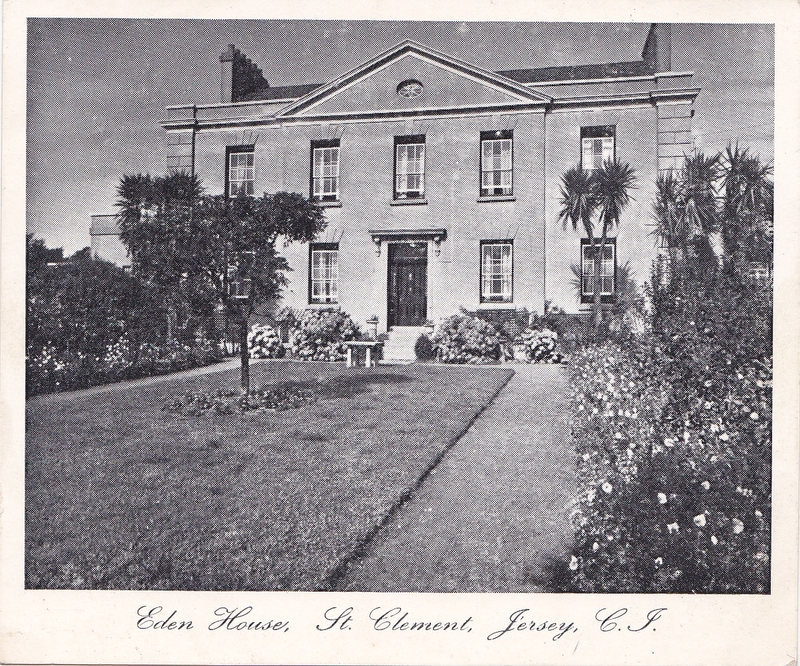 1941 – Pierre is living with his family at Eden House, St. Clement whilst Jersey is under German Occupation during World War 2. Eden House where the Gosselin's lived during World War 2. Looking at GOOGLE Maps there is a road leading to the town of La Haye Du Puits, Normandy called ‘La Rue de la Gosselinerie’. A large Dutch genealogy database shows 29 documents with the name Gosselin in it. But indeed the name doesn’t sound very Dutch. Thank you for sharing your information about the Dutch genealogy database – I certainly haven’t come across any Dutch family members yet. When I lived in Normandy, I noticed there were several pages of Gosselin’s in the phone book, but not as many anywhere else I lived…so definitely a Normandy connection! Must explore this Gosselinerie… sounds like a factory!!!!!!!!!!!!!!!!! Although I have only tracked our ancestors back to Cotes D’Amor I am sure there would have been some travel between Brittany and Normandy at some point in history. It would be great to find out about the history of Gosselinerie Lane! And there is also one in Geffosses, Normandie, near Coutance. The houses there look very similar to the ones in Jersey ! I think I will definately have to plan another trip to France to visit Normandy and check out La Gosselinerie plus Plancoet in Brittany. la famille Gosselin est originaire de Prouville, dans la somme (80) France , c’est une famille de tisserand, puis maréchal ferrant à Plaine Haute (22) France.